When the clothes don’t fit, or you’re running late, it’s always nice to know your hair looks great. 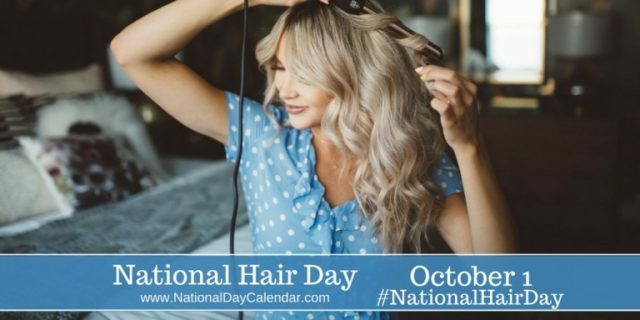 On October 1, National Hair Day gives the nod to all the styles, products, tools and people who keep our hair healthy and looking its best. Whether we are seeking a new cut or we’ve found the perfect one, we want to keep it looking as fresh as it was when we left the salon. The right styling tools and hair care products go a long way toward maintaining a healthy, luxurious hairstyle. From fine and thin to thick and course, there are products out there to curl, straighten, repair, lift, enrich, volumize, moisturize, restore, hold and sculpt! Creating unique hairstyles is an art form and health regime, too. Black is the most common hair color in the world. Red, which only exists in about 1 percent of the world’s population, is the rarest. Blonde hair comes in a close second, with only 2 percent of the population. When did it become popular to color hair? In 1950, only about 7% of women colored their hair, but in 2015, it’s up to about 75%. Beauty can take time. The average time a woman spends to wash, dry and style her hair is 1 hour and 53 minutes a week. By the time she is 65, she will have spent 7 months of her life doing her hair. On average, hair grows .3 – .5 mm per day, 1.25 centimetres or 0.5 inches per month, and 15 centimetres or 6 inches per year. Trying to grow out your hair? It takes about 7 years to grow it to your waist, and 3 years to grow it to your shoulders! In the Victorian Era, hair was used as jewelry! People had brooches, pendants and watch fobs made from the hair of lost loved ones as a stylish way of paying homage. A strand of hair is actually stronger than a copper wire with the same diameter. How much hair do we have on our scalps? More than you’d think. The average person has 100,000 – 150,000 strands of hair on her head (so don’t worry too much about the 40 – 150 you lost today). Now for some cultural statistics: 90% of Japanese people wash their hair twice a day, 80% of North Americans wash their hair twice a day, and only 25% of the European population washes their hair daily. Do you think we should wash our hair every day? The scientific name of grey hair is canities and a split end is known as trichoptilosis. In Ancient Rome, women used to dye their hair blonde with pigeon dung. All of the hair follicles in the human body are formed by the time we are just five months old in the womb.